I’m impressed by the amazing acts of persistence, the bulldog tenacity, in our history. People who refuse to quit because they’ve got an unwavering focus for what they must do. Thomas Edison figured out a thousand ways to not develop a workable light bulb. Abe Lincoln failed as a businessman, never was a great lawyer, and failed at countless attempts for a political office. Winston Churchill twice failed the entrance exam to the Royal Military Academy. Henry Ford failed and went broke five times before seeing any success. Perseverance motivated them all. They didn’t quit. No history prepared me for Ryken, who refused to be thwarted in reaching his goal. He’s not quite eleven months old. We’ve had a houseful of balloons. Had a gathering, and my thinking is, if you’re going to blow a few up, blow them all up. Apart from intentionality, they don’t go away quickly. For which Ryken has been immensely grateful. We were sitting around, talking. Ryken was investigating the territory. Sizing it up. The balloons grabbed his attention–and became his focus. 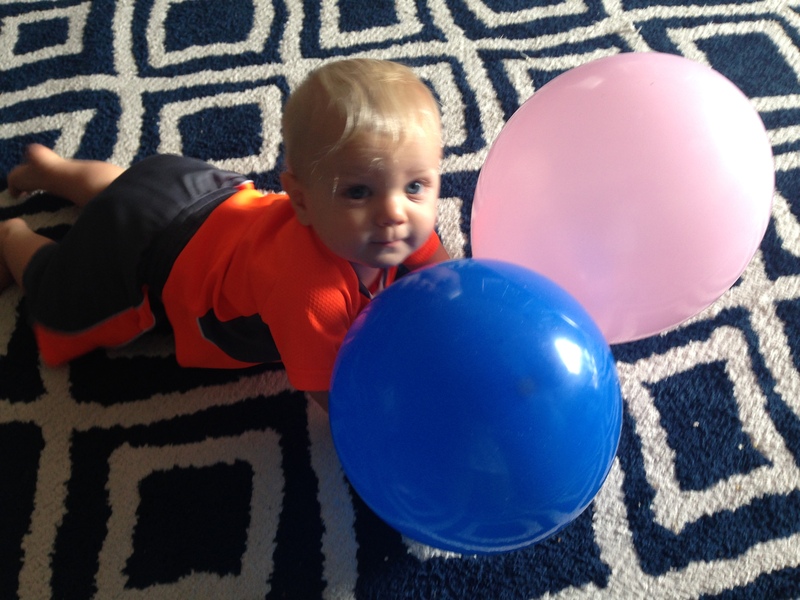 He grabbed a blue and pink balloon by their knotted tips and figured out how to crawl without losing them. He had to adapt. Lifting his arms higher, pushing them as well as lifting them. Then he hit the stairs. He’s been fascinated by stairs for about a month. He’s worked hard at learning to go up them. Hasn’t mastered down at all. When he got to the stairs, he sat back, frog-style, looking first at the steps. Then at the balloons in his hands. 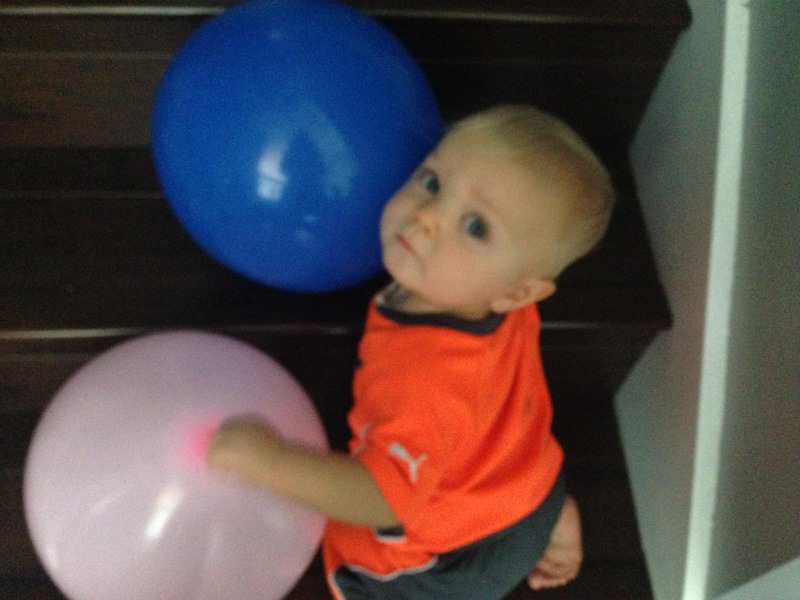 Flipping the balloons up, he began his way up the stairs. Not letting go of either. He’d get a step up, begin a slide, correct his position, and continue. Dang, that boy’s got tenacity! I wish I had that kind of perseverance. I struggle with self-confidence. I often hesitate to try things I believe I could possibly do because of a fear of failure. Ryken doesn’t fear anything right now. Fear is a learned response. He keeps trying because he doesn’t know he can’t do it. I fear that things won’t turn our exactly as I want them to. Which in my world translates to failure. Failure isn’t fatal. It’s opportunity to try again. God says that difficulties, hardships–failure–actually help develop perseverance. It’s when hard times come that I actually find whether I’ve got what it takes to hold–or fold. I’ve learned to fear failure. My culture and my personality have trained me to expect the best of myself. Anything less than that just doesn’t cut it. God gives grace lavishly. He gets it when I don’t do it right. And isn’t surprised or disappointed by my failures. I’m taking a page from Ryken’s playbook. Push through, Dayle. If you slip, slide or slam into the floor, pick yourself up and dust yourself off. That way may not work. But another way just might. Posted by daylerogers on August 10, 2015 in Uncategorized and tagged Abe Lincoln, balloons, failure, God, Henry Ford, joy, opportunity, perseverance, potential, tenacity, Thomas Edison, Winston Churchill. I have experienced you as a go-getter. Loving people as you do is a win-win situation. Even with the bumps in the road. Looks like Phoenix, our granddaughter has the same tenacity as Ryken. Much love to you! BJ, you’ve been such an encouragement to me in so many ways. I bet Phoenix is a little go-getter. Have you connected with Jill Monarch about her son Sam and his challenge not having a right arm from the elbow down? She’s at jill.monarch@cru.org. Get ahold of her, my friend! So fun to learn from someone so darn cute! He’s a heartthrob, that’s for sure. His daddy is gonna be holding the girls off with a pitchfork when he gets older! [I agree with Terry!] I better stick with Ryken, Dayle and develop some perseverance with my balloons! I don’t know if I can do it or not – better test my FAITH and HIS GRACE on this one! Blessings! Thanks, Lo! Perseverance is tough. It takes grace to get moving, grace to keep moving. Grace to keep hoping. It’s wonderful to know that God is the One who hangs in there with us. He is such a cutie! Looks a lot like Logan at that age, and just as determined to get to where he wants to go. Maybe we should try juggling balloons more than plates or balls and slip/slide with our hands full of them…maybe if we then land on them or drop them it wouldn’t hurt so much. Glad God’s grace helps with the hard landings. Amen, Pen! 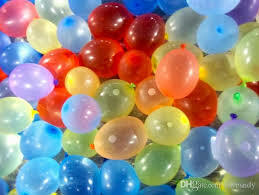 Balloons would definitely be more comfortable–but then I have to ask myself if that’s what I’m aiming for? Comfort or truth? Good golly gee whiz, it never stops, does it? Love you!